Trackday Xperience Events are run Rain or Shine. Just like normal driving it is just as important to handle your vehicle on the track in poor conditions. The ONLY exceptions are clients that have open top cars, with no solid roof option ( Caterham, Fraser and similar vehicles). 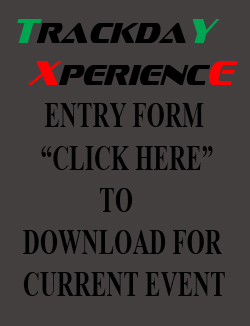 Should the Weather or any other “ Force Majeure “ cause the cancellation of the meeting, Entries will be transferred to the NEXT available Trackday Xperience Trackday. All entries are by Invite only and are to be Pre-booked & Pre-paid unless special arrangements are made. We will however transfer entry to any other Trackday Xperience Trackday within the next 12 months as long as these conditions are met. If notified more than 1 week out prior to the relevant date a full credit will be transferred to another Trackday Xperience Trackday within the next 12 months . If notified after the close off date ( generally 4 days prior to an event) a booking fee and the catering component will be deducted and the balance will be credited to an upcoming Trackday Xperience Trackday within the next 12 months. This is necessary as there are fixed costs ( Track hire, Catering & Staff etc) that have to be covered regardless. We pay for the circuit whether it gets used or not. We Limit the number of entries to ensure everyone gets the maximum amount of track time and access to Instructors throughout the day. · Trackdays are by invitation only. The purpose of the event is for drivers to gain experience with their vehicles and advance their driving skills. It is not a competitive motorsport day. There will be no racing or timed events. · You need to bring your own helmet and cotton overalls. All drivers and passengers must wear a helmet and a minimum of cotton overalls when out on the track. · All road cars participating must have a current WOF. It is also your personal responsibility to ensure that the brakes and tyres of the vehicle are maintained to a high standard and suitable for this type of event. If you have any doubts, please consult a professional mechanic or service centre who are experienced in these types of events. · MANFEILD TRACKDAY: As a price guide, the cost of 1 car and 1 driver is $200. Dual driver/single car entries are acceptable. Extra drivers are $90 per car. Spectators or friends are very welcome to come along. We charge $25 per person to cover the catering costs. · TAUPO TRACKDAY: As a price guide, the cost of 1 car and 1 driver is $395. Dual driver/single car entries are acceptable. Extra drivers are $90 per car. Spectators or friends are very welcome to come along. We charge $20 per person to cover the catering costs. · All drivers, passengers and spectators must sign an indemnity form. · The event will still be run in wet weather. There will be no refund however in the unusual circumstances of the event being cancelled due to extreme weather conditions. Driver and vehicle safety will be the priority in making any cancellation decision. · All drivers must sign a Terms and Conditions form for track usage and attend the Drivers Safety Briefing. · All drivers must attend the Drivers Safety Briefing (NO EXCEPTIONS). If you arrive late we will endeavour to give you a personal briefing as soon as practical. Unfortunately you must not drive on the circuit prior to this. · Prior to driving onto the circuit on all occasions, all cars must come to a complete stop at the compulsory stop sign located at the end of the pit road where it intersects with circuit. It is the driver’s responsibility to ensure there are no vehicles approaching before proceeding from this point. · While on the circuit, there will be no overtaking another vehicle whilst either vehicle is cornering. The corner is defined as the area of the straight where either vehicle is braking prior to a turn, – all the way through to the point where both vehicles begin accelerating in a straight line away from the turn. · No Alcohol is to be consumed by anyone driving a vehicle. · Drivers will be asked to leave the track for the remainder of the day if they are driving in a manner that may endanger other drivers or their cars. · Meet in the Corporate Suites above the track at 9:00am to confirm your registration and sign an indemnity form. Drivers Briefing will begin 9.30 Sharp. Please time your trip to allow you to arrive between 8.45 and 9:15am. Please drive safely on your way to Manfeild and Taupo. To Manfeild allow around 2 1/2 hours from Wellington, and 2 hours from the Hawke’s Bay. To Taupo allow around 4 1/2 hours from Wellington, and 2 hours from the Hawke’s Bay. Please drive safely on your way to the circuit. Created by laurahusson.com | Copyright 2005-2017 All rights reserved.